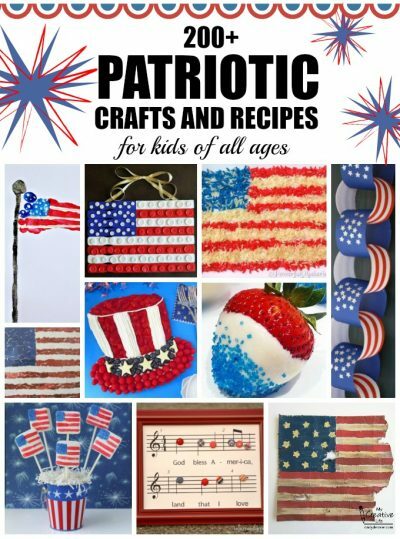 Whether it’s the 4th of July, Memorial Day or even Patriot Day, we have tons of patriotic crafts and recipes for you to choose from. So sit down with the kids to make something red, white and blue! Here are 10 of our favorite patriotic crafts and recipes. Be sure to check out all 200+ project ideas. 1. American Flag Footprint – Create an adorable flag featuring a child’s footprints. This easy project makes a great keepsake for parents or grandparents. 2. God Bless America Frame – Show your love of the USA with this beautiful patriotic frame. It makes a wonderful gift for a special family member, friend, teacher, or mentor. 3. Patriotic Strawberries – These tasty snacks add great color to any patriotic party or celebration. They’re really easy to make and fun for kids of all ages. 4. Patriotic Paper Chain – Make chains from red and white striped patterned paper and blue construction paper, then add some stars! Use it as holiday decoration or to count down to our nation’s birthday. 5. Sugar-Coated Marshmallow Flags – Make this simple and tasty craft with nothing more than a paint brush, water, and colored sugar. It’s the perfect centerpiece for a patriotic celebration. 6. Flag Magazine Mosaic – Create the United States flag using an old magazine or catalog. This easy craft takes some time but costs practically nothing. 7. Colored Rice American Flag – Dye white rice to make this festive American flag! It’s a great activity to do as a family for the 4th of July. 8. Uncle Sam’s Hat Fruit Pizza – This patriotic fruit pizza features a sugar cookie base, cream cheese fluff and juicy, fresh fruit. It’s so delicious you’ll want to make it all year long! 9. Paint Stick Button Flag – Make an adorable flag using paint sticks and buttons. 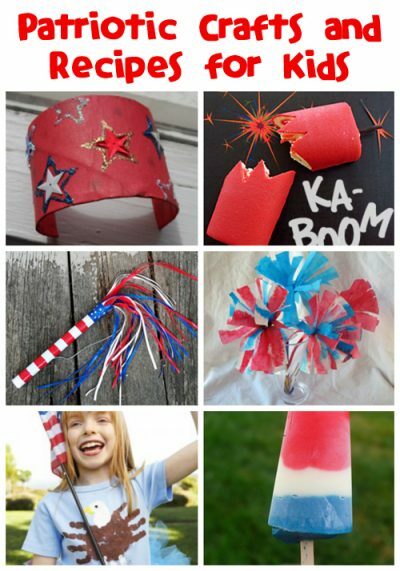 This project is perfect for July 4th or to show patriotism year-round. 10. Cardboard Star-Spangled Banner – This Star-Spangled Banner project combines math, history and art to make a replica of the flag original flag that inspired Francis Scott Key to write the National Anthem. It’s a great activity that costs practically nothing. You can see these and all our other patriotic crafts and recipes here!